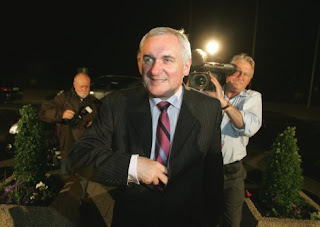 Taoiseach Bertie Ahern arriving at RTÉ last night. Mr Ahern said it had been a great night for Fianna Fáil, and he expected the party to win about 79 seats. He said he would serve as Taoiseach until May or June of 2012, when he will be 60. Garett FitzGerald, writing in the The Irish Times observes that, in relation to Sinn Fein's drubbing in the polls in the recent Irish General Election, "As a somewhat partitionist observer maliciously remarked to me, even with the recent remarkable improvement in Irish-British relations, the people of this State are not yet ready to welcome the intervention of a member of the British parliament in the domestic political affairs of this State!"